This excerpt comes from chapter "One Step Ahead of the Bombs" the testimonial of Zosia Krakowiak recorded in 1997. 1. One of the ways that young people can to be exposed to the horrors of the Holocaust is from the prospective of the Gentile heroes who put themselves in danger to save Jews during World War II. Aristides de Sousa Mendes, the Portuguese Consul General in Bordeaux, France in 1940 saved my family by issuing visas to Portugal against the explicit orders of the dictator Salazar. The overwhelming majority of the worldwide inter-generational Holocaust survivor community, including Generations of the Shoah International’s (GSI) Coordinating Council, agree with Elie Wiesel's recent statement in the New York Times that affirms Israel's absolute right to self defense. This afternoon Joan finally had the pleasure of meeting Isabelle Coelho-Marques President @NYPortuguese at the showing of the film "Disobedience: The Sousa Mendes Story" presented by the Jewish Arts & Film Festival @StamfordJCC. And, in addition, to find that they have much in common. 2. They are both of the opinion that there should be an 11th Commandment: Spread the good word! Here are Isabelle and Joan with Eileen Berets, Sousa Mendes visa recipient, who shared her deep appreciation for Aristides de Sousa Mendes' act of moral courage that save her family. Frederica Jordão the talented and sympatica ( English = one having mutual understanding with another) resident of Figueira da Foz, Portugal, is one of the 2016 American Club of Lisbon Award winners. 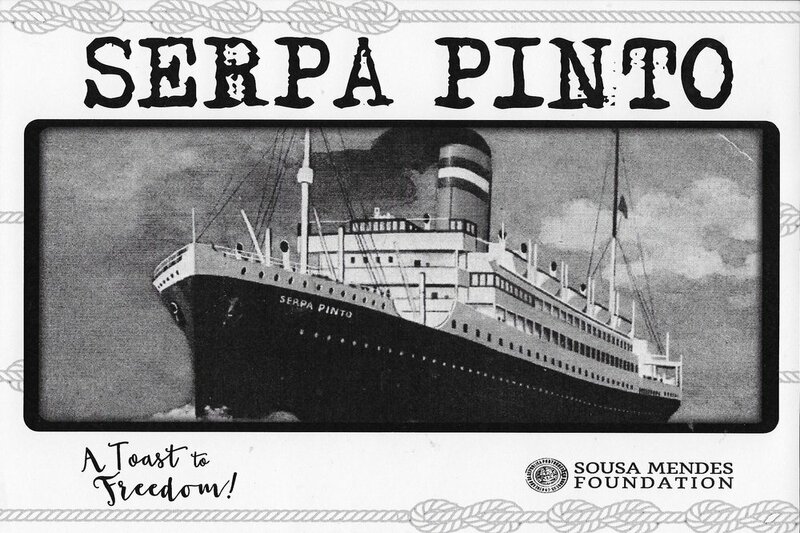 Read her report from: The Sousa Mendes Foundation Gala " A Toast to Freedom"
In the USA, showcasing the photographs with WW II to refugees and / or their descendants. Together we’ll share stories, ideas and hopefully identify the people portrayed, thus reconstructing their trails, from their homelands in Europe to the USA safe haven. Frederica had all the good intentions to travel light, but books she couldn't resist and the toys requested by her two small children modified her plan. Joan dedicates her book. My Sister's Eyes , and bids her friend a fond good-bye or rather so long till we meet again in the garage of Terminal C at Newark Airport. Congratulations to Frederica, my friend, for a job very well done. Mariana Abrantes (left) , elected Director of the ALC of Lisbon (and Treasurer of the SMF) with former US Amb. Robert A. Sherman (standing next to Mariana). On the eve of Kristalnacht the German premiere of the film THE CONSUL OF BORDEAUX about the “Portuguese Schindler” (Their comparison not Joan's) Babylon Theatre , Rosa-Luxemburg-Straße 30, Berlin. "Through a daredevil action in 1940, Aristides de Sousa Mendes helped many people in distress and gave them “the ticket to freedom, to life”. Despite being forbidden to do so by his government, the former Consul General saved around 30.000 people, of which around 10.000 were Jews, during the Second World War by granting those visas to Portugal. The 30th Jewish Culture Days in Berlin present the German premier of the Portuguese film “The Consul of Bordeaux” (in German), which tells us about the story of the still celebrated hero. Sousa Mendes; grandsons, Gerald and Sebastian Mendes were present, alongside co-producer and Film music-composer Henri Seroka." 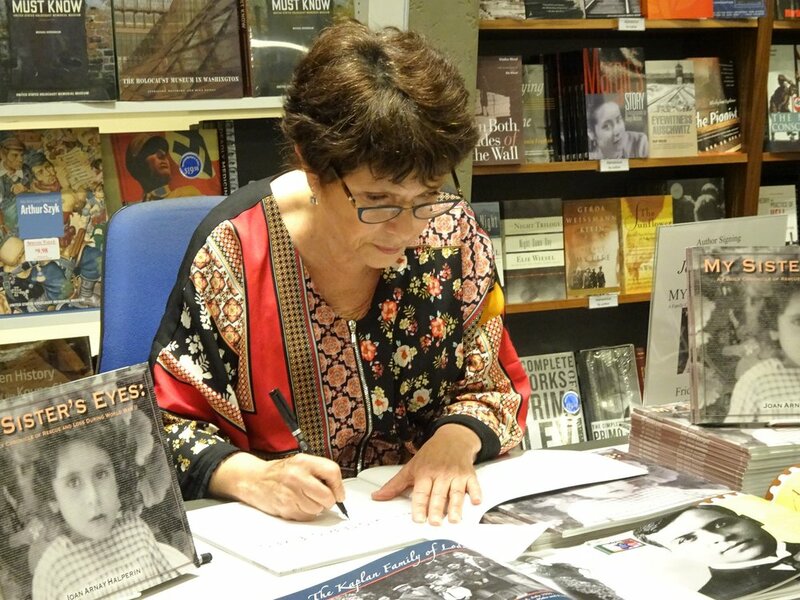 My Sister's Eyes: A Family Chronicle of Rescue and Loss During World War II, the book which the author, Joan Arnay Halperin (pictured below left 😁), calls "a love poem to the Portuguese people" is available at the Fronteira da Paz Museum, Vilar Formoso, Portugal . n 2012 Joan got serious about writing the book about how she found out that her parents had had a child, a daughter that they had loved before her. You could call it a “dual” memoir. It was her mothers’ story and how it affected her. You could say that she was trying to understand her life, its twists and turns and their consequences. She had written quite a bit and then, she Googled “Portugal 1940”. Today I met the very talented Luso-Americano artist Julio Rodrigues and his wife Maria at the Nova Alianca Bakery in the #Ironbound District of Newark, New Jersey. We met so that he could give me his donation to the silent auction to benefit the SousaMendesFoundation Gala "A Toast to Freedom". "Beautiful title for an amazing story!" Disclaimer - Kind Words from an old, I mean long-time, friend. Joan Arnay Halperin : Thank you, Laura Kerr for ordering MY SISTER'S EYES. Maybe it will help you get your mind off your massive restoration after hurricane Irma for a while. How will you find a quiet place to read? Pix are worth a thousand words. Joan Arnay Halperin at author's table. Parents buy My Sister's Eyes for their children. "They must know. Information is power." This is a family affair. 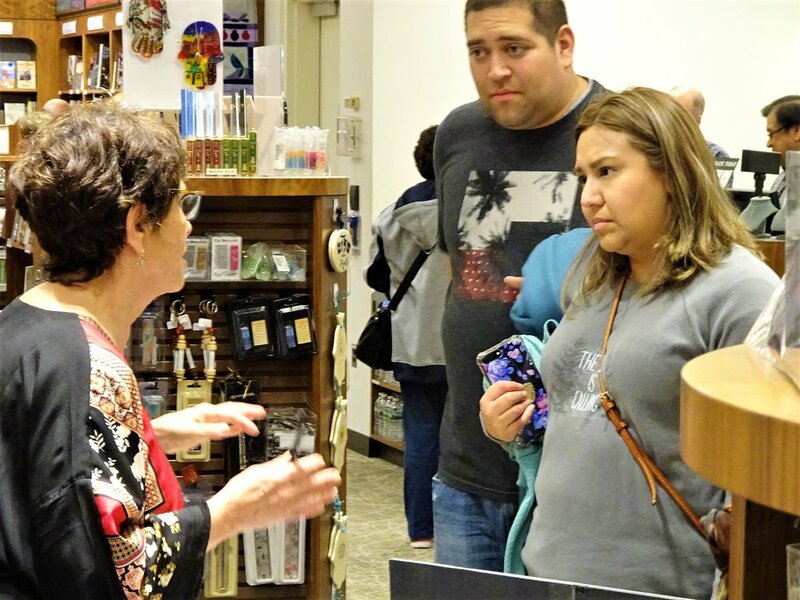 Richard Arnay, brother and enthusiastic supporter, joins Joan at the USHMM Museum Shop and buys copies of My Sister's Eyes to share with his friends. And, special thanks to Itzhak Halperin, Joan's partner of 44 1/2 years, the eye behind the lens. Kind words from Laurie W. with special praise for the graphic designer. I just read your book cover to cover this morning and cried several times. It's a powerful, emotional story. I love all of the family photos and the artifacts your family held onto. It was moving to hear a personal account of people saved by De Sousa Mendes and in a few short pages you painted an unforgettable portrait of the man and his wife. The story of your sister was a complete surprise and really touched me. I like the way the book design anchors the reader in time and place with the maps and dates inset. What a journey you took to unearth all of this history. And how meaningful. Laurie W.
The map with date stamp is a creation of the multi-talented graphic designer, Rosanne Guararra. This review of MY SISTER'S EYES on @amazon #VerifiedPurchase nearly knocked me out! 5 out of 5 Stars - " Brought me to tears "
Wonderful, moving book with excellent photos. Heartbreaking true story of war, trauma and healing love, to be shared with family and read over and over again. Orange Street Cemetery, Kingston Jamaica, BWI - 1942. "Here lies our adored little girl - Yvonne Krakowiak - Born June 1, 1938 - Deceased June 4, 1942 - Only child of Halina and Ignace Krakowiak." Preview My Sister's Eyes: A Family Chronicle of Rescue and Loss During World War II. "Fronteira da Paz" Museum, Vilar Formoso, Portugal, August 26, 2017.